IBPS Clerk admit card 2018 has been released. The main exam is scheduled to be held on 21 January 2018. Candidates can download the admit card at the official website ibps.in. Candidates can download the admit card using their registration number or roll number and password or date of birth. 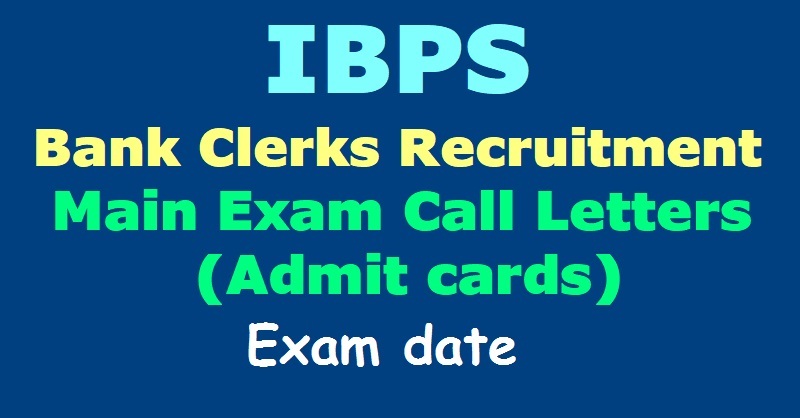 IBPS Clerk Main Exam admit card is available at the official website ibps.in. Institute of Banking Personnel Selection (IBPS) released the notification for recruitment of Clerks. The Preliminary Common Written Exam (CWE) Clerk VII was conducted in December. A total of 19 banks are participating in the CWE for Clerk this year with the vacancies amounting to 7884. The minimum eligibility qualification for the recruitment is a graduation degree. The selection process remains the same as last time with IBPS conducting a preliminary qualification round and then Main exam. Online Main Examination consisting of Objective Tests for 200 marks will also be conducted online. The total test duration would be of 160 minutes. The candidates shall be required to qualify in each test as per cut-off marks determined in each test. Each candidate will have to secure a minimum score on each of the tests as well as on the Total to be considered for provisional allotment. However decision of IBPS in this regard shall be final and binding upon the candidates. THERE WILL BE PENALTY FOR WRONG ANSWER MARKED BY YOU IN THE OBJECTIVE TESTS. There are five alternatives in every question of a test. For each question for which a wrong answer has been given by you, one-fourth or 0.25 of the marks assigned to that question will be deducted as penalty. If a question is left blank i.e. no answer is given by you there will be no penalty for that question. YOU SHOULD THEREFORE BE CAREFUL IN MARKING YOUR ANSWERS. Step 3: After clicking on the link, the candidates shall be required to enter their Registration Number and Password in given space and then click on Login. Step 4: After login, candidates will be able to download the call letter of the main examination. Step 5: Candidates must read all the instruction mentioned in the admit card. Thank you very much sir. You done good job. This Information Valuable. Keep it up. I follow your website daily. "DEPARTMENTAL TESTS NOTIFICATION WISE RESULTS WITH CANDIDATES NAMES AVAILABLE" THIS INFORMATION USEFUL TO OUR SCHOOL TEACHERS. Very useful Information provided in this page. This is useful to teachers. nice..... good job......!!!!!! Departmental Tests Results Information useful to teachers and Other Department Employees.